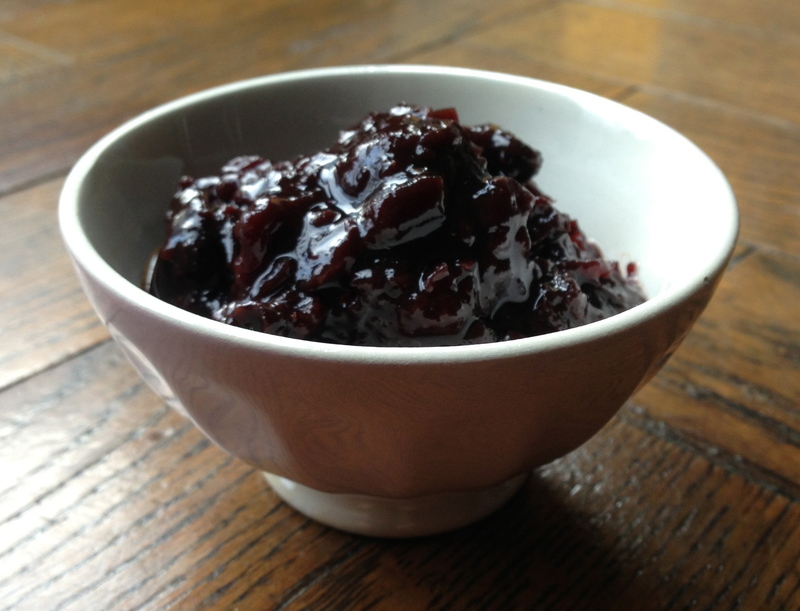 Damsons are the most delicious plum to cook with. Sharp and deeply flavoured, in my opinion they make the very best chutney you can eat, and the strongest flavoured plum jam. I was overjoyed to find them in my local Borough Market a few years ago – but not so overjoyed by the exorbitant price. 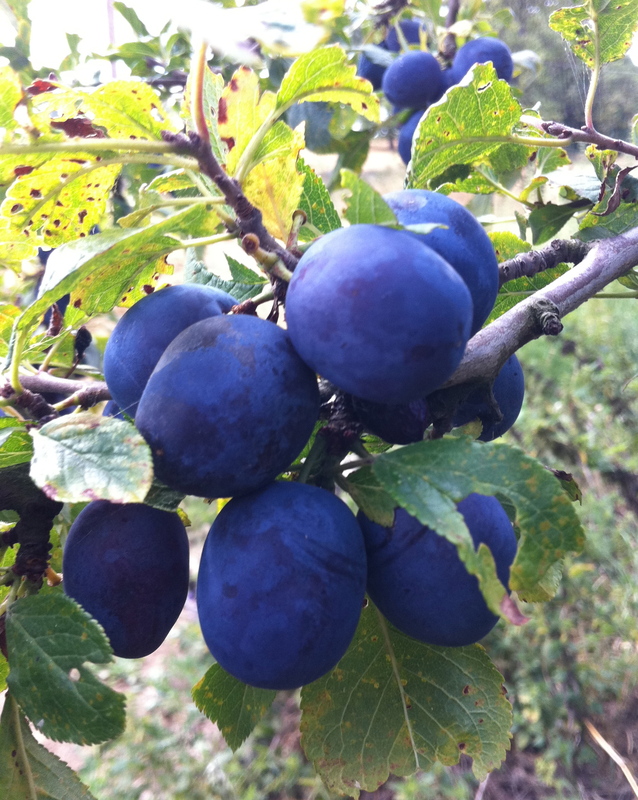 So, imagine my delight when a late summer walk in Kent revealed damson trees galore! Every one of them was groaning with fruit, they were all on public footpaths: these were rich pickings. I suppose they must be remnants of the days when all of Kent was covered in orchards. In full sunshine the fruit gleams an almost blue purple; once in my city kitchen they take on a deeper hue, with a gorgeous bloom. Inside, the fruit is a yellowish-green colour. 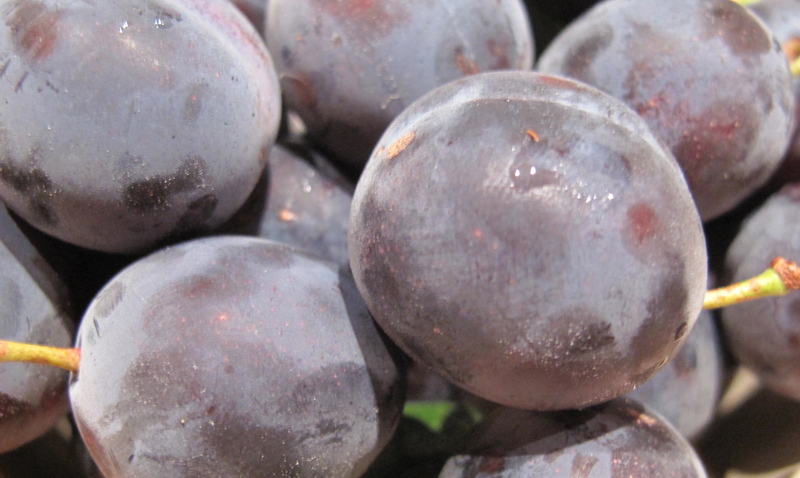 The plums are small and firm, with flesh sticking to the stone even when fully ripe, so a lot of recipes advise cooking them before removing the stones. If you are simply stewing them for a dessert, I’d go along with this, but for any preserving I prefer to take the time to stone them first. I hate the mess and waste of fishing them out of a sticky jam or chutney. Perhaps I’m weird, but I find that just me, a knife and a big bowl of damsons sitting somewhere comfortable can turn into quite a pleasantly meditative task. If you can persuade someone to help you, all the better. I always make as much of this as I can as I know I’ll eat it all, as well as lose a few jars to friends and family. 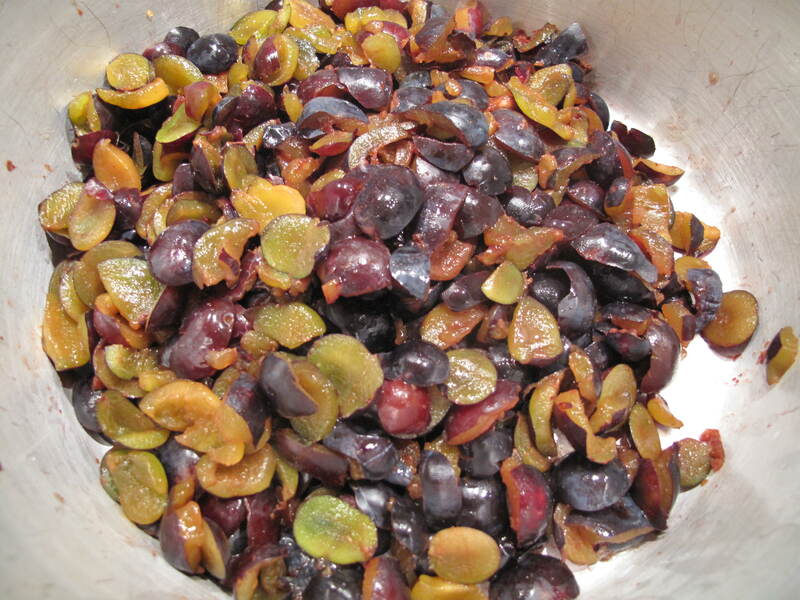 You can adapt the quantities directly to however many damsons you have – just watch the cooking time if you are making a different sized batch (less time for smaller, more for bigger). 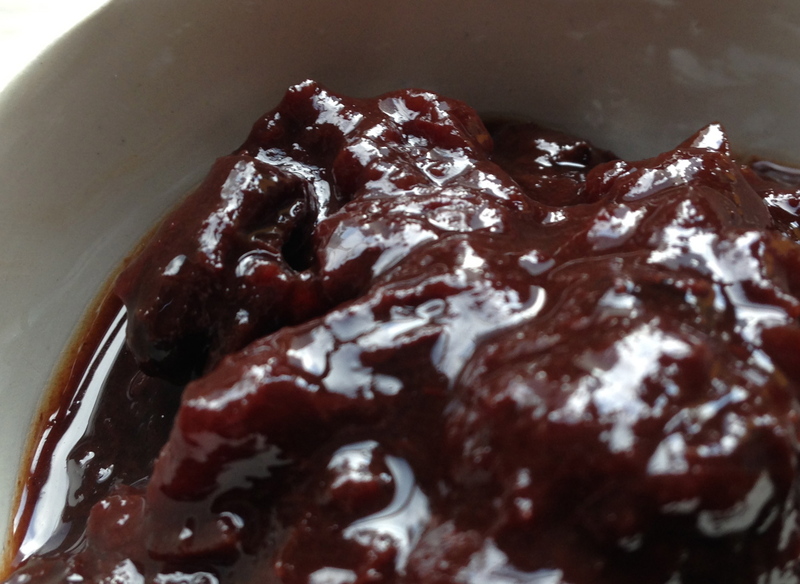 My version has evolved out of the classic Delia Smith plum chutney recipe in her Complete Cookery Course of 1985 (that’s the year of my copy – it was first published 1978). Put everything into a large, preserving pan*, slowly bring to the boil, then simmer very gently for around 2-2½ hours, stirring occasionally to check how it is coming along and to prevent it sticking to the pan. It will continue cooking as it cools down, so don’t go too far, but do make sure that most of the vinegar has disappeared and it has a nice gloopy consistency. Pour into sterilised jars while still warm, seal well making sure there is no contact with any metal, cool and label. Leave to mature in a cool dark cupboard for at least 2 months before eating. *The point of a preserving pan is its extra-wide top – this makes the evaporation go faster and reduces cooking time. If you are using a narrower pan it will take longer. Are you making a larger quantity? If not, I would expect it to be done by now! If you do the running a spoon across the top test and there is very little liquid refilling the channel I think you can go ahead and bottle it. Try using a very large glass or ceramic pastry bowl in the microwave. Cook in a much shorter time and much easier to wash up. Is it possible to freeze this chutney rather than canning it? Hello there – I haven’t tried freezing it but I don’t see why not, as long as you seal it well in containers that will not react to the vinegar (or to being frozen) and freeze it in small enough quantities to be able to use it up once it’s defrosted. It gets eaten up pretty fast in my apartment, but any leftovers in jars seem to keep pretty much indefinitely in the fridge, so it is a very tolerant product as long as you handle the cooking and initial sealing part safely.